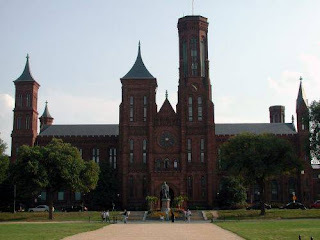 On July 10th, 1846, President James Knox Polk, formerly of Mecklenburg County, 20 miles from where I now reside, established the Smithsonian Institute. It would not be completed for 9 more years and then it became, for a while, the "nation's attic." It's where we put stuff we didn't know what to do with. When I was a kid the Institute was the main attraction with the added feature of the new Air and Space Museum. Now the Institute is a complex consisting of 16 museums in all, including the National Gallery of Art. All are easily accessed by Public Transportation. Get acquanted with them through this link and if you ever have the chance to see our nations Capitol, then make the time to go. Thanks to the vision of one of our lesser celebrated President's, this Museum is still the "nation's attic", and a great place to look at our collective pasts and futures. Exhibit dates and transportation information are provided on the site, which is easily navigated, even by me!